Book any Dolphin Swim Program and get a Free Admission to Wet’n Wild! 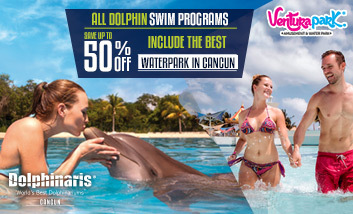 Don’t waste your time, and book this incredible super saver promotion, swim with dolphins in Cancun and enjoy Wet’n Wild Cancun water park with all the fun and All Inclusive (unlimited meals and non alcoholic beverages)! 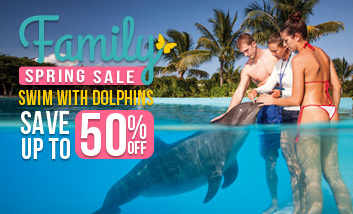 With this amazing promotion you are saving $49.00 USD per person (admission price) plus fantastic savings up to 50% off on your dolphin swim program if you book in advance. This amazing water park is part of Ventura Park Cancun, it has an ample variety of water attractions, slides, wave pool, sunbeds, kids zone, bars and restaurants. Come visit Wet’n Wild and enjoy to the max this family adventure! *Choose your dolphin swim program. Save up to 50% off regular price by booking in advance. All Inclusive (unlimited meals and non alcoholic beverages). Unlimited access to all water attractions and slides. Facilities for the people with disabilities. Other activities and Ventura Park worlds with extra charge. El Beach Oh Bar Ocean Club – Bar & Cevicheria. Meet our NEW FREE SHUTTLE service to Dolphinaris and Wet’n Wild Cancun. Find out more about the pickup and drop off points from downtown and the Hotel Zone. All dolphin swim programs participate (Dolphin Swim Program, Dolphin & Swim Ride, Dolphin Interactive Program, Trainer for a Day). Promotion available on same day booking. Wet’n Wild admission price: $49.00 USD. Promotion valid until April 15th, 2018.